SCHISM modeling system is a derivative work from the original SELFE model (v3.1dc as of Dec. 13 , 2014). SCHISM has been implemented by Dr. Joseph Zhang (College of William & Mary) and other developers around the world, and licensed under Apache. SELFE was developed at the Oregon Health Sciences University. However, there are now significant differences between the two models. 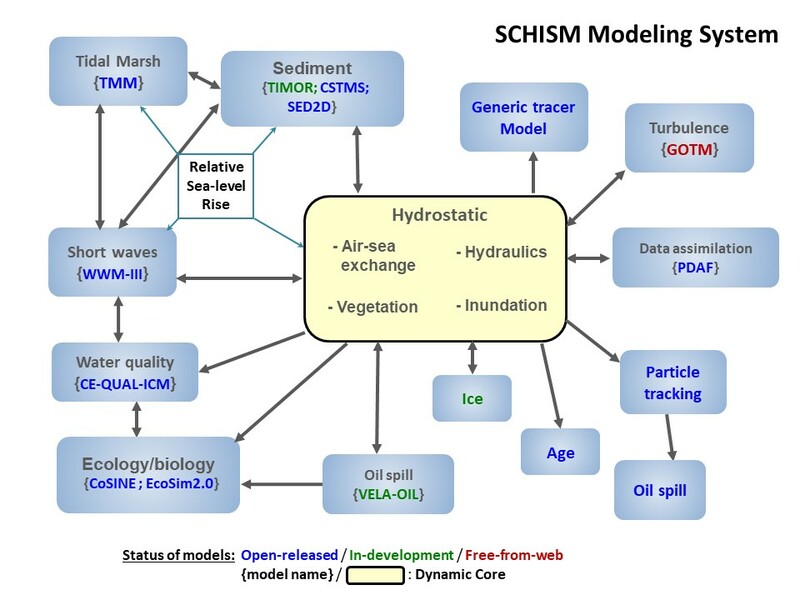 SCHISM (Semi-implicit Cross-scale Hydroscience Integrated System Model) is an open-source community-supported modeling system based on unstructured grids, designed for seamless simulation of 3D baroclinic circulation across creek-lake-river-estuary-shelf-ocean scales. It uses a highly efficient and accurate semi-implicit finite-element/finite-volume method with Eulerian-Lagrangian algorithm to solve the Navier-Stokes equations (in hydrostatic form), in order to addresses a wide range of physical and biological processes. The numerical algorithm judiciously mixes higher-order with lower-order methods, to obtain stable and accurate results in an efficient way. Mass conservation is enforced with the finite-volume transport algorithm. It also naturally incorporates wetting and drying of tidal flats. The SCHISM system has been extensively tested against standard ocean/coastal benchmarks and applied to a number of regional seas/bays/estuaries around the world (see 'Case study') in the context of general circulation, tsunami and storm-surge inundation, water quality, oil spill, sediment transport, coastal ecology, and wave-current interaction. SCHISM now includes many upgrades of the original SELFE code (v3.1dc); the major differences are summarized in Zhang et al. (Seamless cross-scale modeling with SCHISM, Ocean Modelling, 2016; see Publications). The source code and user manual can be downloaded from this web site. The plot to the right shows a snapshot of various modules inside SCHISM. SCHISM (Semi-implicit Cross-scale Hydroscience Integrated System Model) is a derivative product built from the original SELFE (v3.1dc; Zhang and Baptista 2008) and distributed with an open-source Apache v2 license, with many enhancements and upgrades including new extension to large-scale eddying regime and a seamless cross-scale capability from creek to ocean (Zhang et al. 2016). Zhang, Y. and Baptista, A.M. (2008) SELFE: A semi-implicit Eulerian-Lagrangian finite-element model for cross-scale ocean circulation", Ocean Modelling, 21(3-4), 71-96. Zhang, Y., Ye, F., Stanev, E.V., Grashorn, S. (2016) Seamless cross-scale modeling with SCHISM, Ocean Modelling, 102, 64-81.